About 5 years ago my best friend Rebecca mentioned this Yoga Instructor whom she described as one of the most fun instructors she’s ever had. She was instructing a class called Yoga Tune Up which I had never heard of before and Rebecca said I needed a bit (a lot) of Tune Up in my life. She explained the class was essentially massaging your muscles with balls (Therapy balls), and that it was extremely painful but fun…tempting isn’t it? I was keen to try it and Rebecca spoke so highly of Jenna that I was looking forward to meeting her, but only to get to the class and it was a substitute teacher. Typical! Thankfully I did eventually get to get to one of Jenna’s classes and I became a regular at her Sunday morning Yoga Tune up class where a lot of meowing and laughing occurred to get over the slight torture which was rolling out our tense muscles…. It’s great though, really! Jenna is so knowledgeable about anatomy and how body mechanics, and she is so eloquent with how she explains things to people which is so helpful. On top of being such a learned yoga instructor, her positive energy is just so contagious! I am SO excited to virtually introduce you all to Jenna and I hope you enjoy our little chat! I used to feel that the meaning of yoga was to experience long term health and mobility… which, it kind of is, but after teaching for over 6 years, I realize that it’s really not that simple. Yoga, the word, is Sanskrit and literally translates to English as ‘union’. Sometimes it’s said to be union of body, mind, and spirit, movement and breath, asana (pose practice) and meditation; union could mean a lot of things. Right now, to me, yoga is about the union of people coming together who actually want to grow in deeper. Feeling good in your body is awesome, but it’s really just a gateway to finding ease and bliss in all the other parts of your life. Yoga can totally affect your entire life and the union of like-minded people in the practice is truly magical. Is there something in particular about sharing your passion for yoga that keeps you going? I’m 110% about empowering people. Sometimes it’s through a simple yoga class with down dogs, planks, and pigeon poses, sometimes it’s through using the Therapy Balls to reclaim full range of motion or get rid of pain, sometimes it’s learning how to control your breath, and sometimes it’s through a more in depth workshop or training. I can’t convey in words how incredible it feels when students tell me how they’ve been empowered through what I’ve shared. There isn’t anything more amazing than knowing you’ve empowered someone to stay calm through their chemo treatments, empowered someone to play with their grand-kids on the floor, empowered someone to reach a new level in their fitness goals… it’s just THE BEST! I can’t do any of the work for them, all I can do is offer my knowledge and they are the inspired beings that choose how to adapt the tools to use in their own growth and evolution. Any advice for anyone one thinking about taking their yoga teacher training course? Just do it (you’re welcome Nike)!!! People get so caught up in their ability to do the poses, how long they’ve practiced, whether they want to teach after or not… and honestly, none of that matters. JUST DO IT. If you really love yoga and really want to go deeper, it’s so worth it. 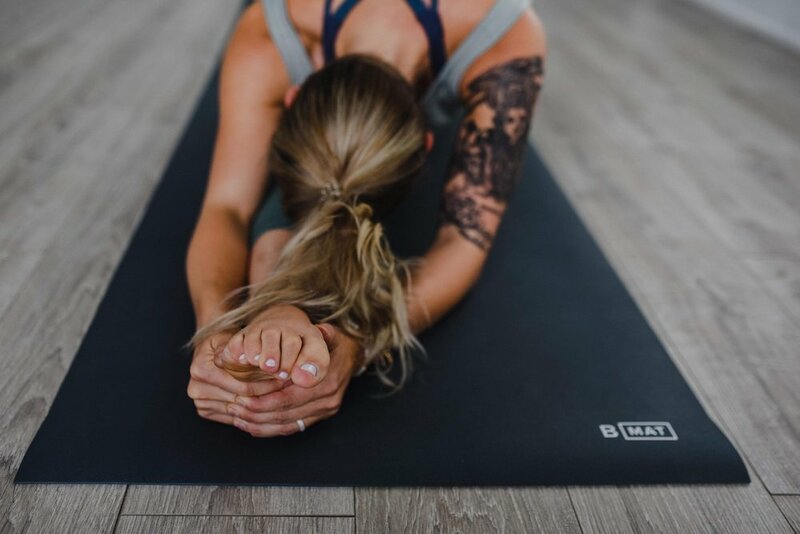 Drop-in yoga classes are the standard in most cities because they work so well in our schedules, but as a teacher, it’s hard to offer an advanced practice when everyone is at different levels and are not necessarily in the class to go “deeper”. The ONLY word of caution I have, is get to know your teacher. You’ll be spending a lot of time with them, and you’ll want to really like being around them! Take classes or try their online content before you invest… but you should 100% invest when you find the right teacher! I took my first 200 hour Yoga Teacher Training not at all thinking I would ever teach. I was in a transitional period in my life, going through a divorce and had just given up my dream of becoming a doctor. I did it because I was lost and bored and was desperate for anything to help me. I loved it. In fact, I loved it so much, I volunteered to assist 4 more training’s over the next few years because I LOVED the depth of learning and the conversation. Since then I’ve lead 2 Yoga Teacher Training’s of my own in Ottawa and am about to co-lead my first intensive training (Feb 1-24) in Bali. Can you give us a brief description of what yoga tune up is to you and how it is beneficial? Yoga Tune Up is a modality that’s focused on decreasing pain, improving posture, and increasing proprioception (awareness of your body). My favourite aspect is the Therapy Ball work. I’ve used it with students from age 10 to 100… k, I don’t actually know if any of my students are 100, but maybe! Athletes, desk jockeys, new moms, it honestly doesn’t matter who you are, Therapy Ball work helps increase circulation and range of motion, mitigate injuries, help you recover from chronic pain, and create a better brain body connection. It’s freakin’ awesome. What is your favourite area to roll, and least favourite? Glutes. I roll my glutes every day and freakin’ love it. I NEVER get tired of working through all the muscles on my backside! Upper Trapezius is my nemeses. It’s always SO sensational I can’t even talk while I’m doing it. Sometimes, when I try to instruct it in class I have to demo silently because it’s so intense and then explain after. Traps are the worst! I remember in your classes rolling the pelvic floor and I saw you had a workshop on recently about the pelvic floor. I’m sure this could be a segment on its own but what are we missing out on by not paying attention to the pelvic floor? I’ve recently been told that my pelvic floor is too tight and that physiotherapy would be my next step, and I was mind blown that a) I didn’t know about pelvic floor issues, and b) I could need physio for it. It’s still such a mystery to me and I’m sure to many others. Yeah, this is definitely its own full topic. Pelvic floor dysfunction is crazy common in men and women. Women, partly because we’ve all been taught we should be doing kegels every day (you’re doing them right now just because I wrote the word! ), and Men because it’s so taboo to talk about. When I first started exploring the topic of pelvic floor, I had three guys who were personal trainers or athletes admit to me (in confidence and separately) that they have incontinence issues. How crazy is that?! I had started exploring this work a long time ago and done a lot of research, but it wasn’t until I started doing the work to heal from a trauma that I really understood how key this work is. Especially as women, we deal with a lot of emotional trauma associated with this area and kegels are NOT going to help. It’s crazy how an entire area of our body can be ignored except when it doesn’t work well… and then we’re all too shy to talk about it. It affects your breathing, ability to experience sexual pleasure (that should motivate! ), bathroom issues… there’s a lot of daily activities that this needs to be functioning well for. Again, this comes back to my passion about empowering people to take care of themselves. Yes, physios are awesome, but there’s SO much we can do ourselves to take care and decrease our dependency on other professionals to stay healthy. Yeah man! Co-leading a YTT in Bali in February, then I’m back and offering an Advanced Anatomy, Physiology, and Biomechanics in Ottawa early April. I’m running another Yoga Teacher Training at Pranashanti over the summer in Ottawa. Planning lots of workshops (definitely Pelvic Floor! ), finalizing some online courses, and hoping to join in a few festivals happening this Summer! What do you do on a daily basis to get that #HIHmoment? Meditation!!! I love what I do, but being an entrepreneur is a wild ride and if I don’t take at least a few minutes every day to myself, I don’t stay grounded or focused. I’m IN LOVE with malas and I’ve been using a mala for what’s called ‘japa’ meditation where you repeat a mantra, word, or phrase, as you run the beads through your fingers. It’s a game changer habit to have. The list of questions I had for Jenna could have gone on forever, but I hope you enjoyed our little chat! You can find her on Instagram @Jenna_Switzer, and check out her web page www.jennasyoga.ca. If you have the chance to pop in to any of her classes say hello to her from me!